A local company has created a ‘portable whiteboard’ for laptops, in an effort to make everyday on-the-go note-taking easier for workers in the city’s tech booming industry and beyond. The product, known as Sketchcase, is a “premium laptop skin” that turns the cover of your laptop into a portable whiteboard. This is accomplished by Sketchcase using a combination of anti-graffiti and scratch resistant materials to create a fully-erasable whiteboard, similar to the full-sized ones used in boardrooms and schools. Underneath is a premium vinyl that utilizes air egress technology to prevent air bubbles, making it very easy to install. “People have been using whiteboards to come up with amazing ideas and to solve all sorts of problems,” says Charles Han, founder of Sketchcase. The product’s “anti-graffiti surface” prevents ghosting and staining from ink. 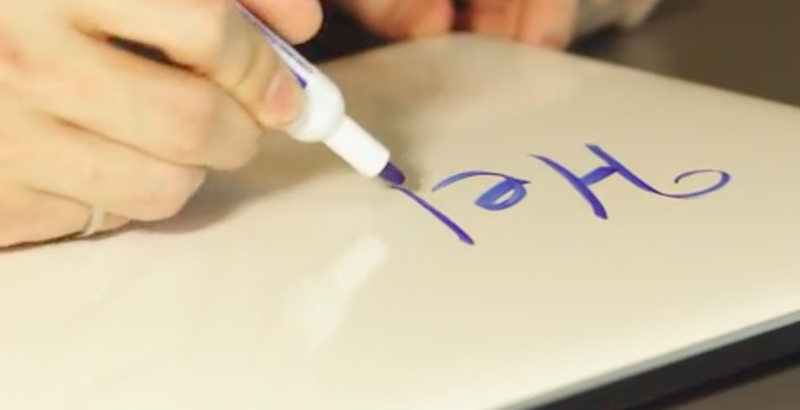 This allows for easy removal of dry erase, wet erase, and even permanent markers. Sketchcase Whiteboard Skin will be available for preorders this month on Kickstarter and, pending the company’s fundraising goal of $4,000, will be available for general retail in spring 2018. The product is currently priced at $25 USD. However, the company said the product will be available for the starting early-bird discount price of $16.